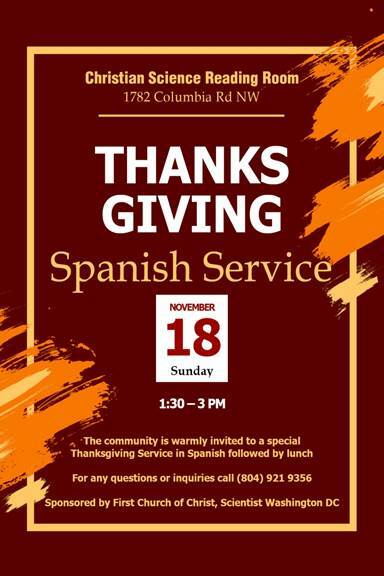 The community is warmly invited to a special Thanksgiving service in Spanish at the Adams Morgan Christian Science Reading Room (1782 Columbia Rd, NW, Washington, DC). The service will take place the Sunday before Thanksgiving, November 18th, at 1:30 PM. It will consist of inspirational readings, time to express gratitude and a light Thanksgiving lunch. Please reach out to Esteban Xifre at (804) 921-9356 with any questions.